My Facebook feed is filled with pictures of kids with huge grins and excitement on their first day of school. It’s such a happy time in Jeffco, with a few tears as our babies grow up a little more each year. As we advocate to change the climate in Jeffco so those grinning kids entering school today will have the same opportunities as those who have come before them, we have a major concern – staff! There are 187 positions currently unfilled in Jeffco! We started school missing 187 people who serve our children. THAT makes an impact on our children. A negative impact. 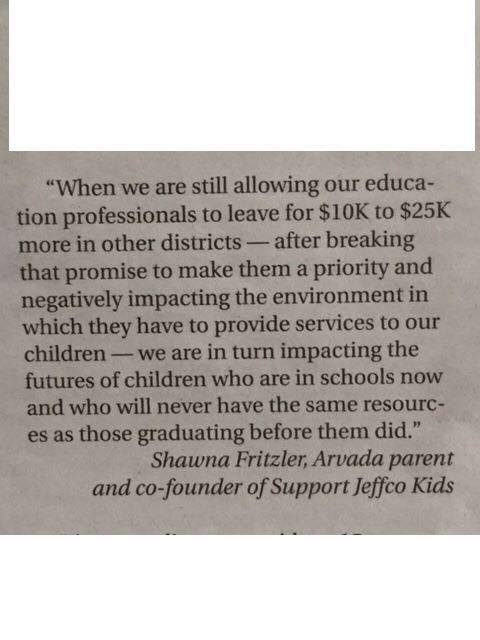 As we attended various back to school events, we heard time and again about more teachers leaving over the summer as well as some who had interviewed and accepted positions only to find a better offer and decide to leave Jeffco. These are the people who change our childrens’ lives on a daily basis! The Board majority’s lack of accountability to this community is negatively impacting our children. We need to continue to advocate strongly and support the amazing staff we have to ensure we are giving them reasons to stay while there is such turmoil caused by the actions of the Board majority. We made promises to staff when we passed the mill and bond in 2012. We need to follow through and ensure that everyone takes action in November.